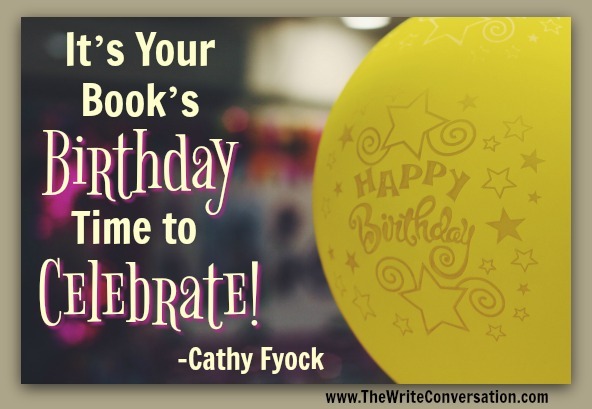 The Write Conversation: It’s your book’s birthday: time to celebrate! It’s your book’s first (or second or third) birthday . . . so what? It’s your opportunity to make a big deal of this anniversary and gain new exposure for your book. What messages in blogs, articles, and on social media might be appropriate for your book’s birthday? What’s happened with your topic since your book was first released? Why is your book more timely today? What are the trends that your book discusses? What new, unexpected insights have you gained since your book was released? How have your readers benefited from your book? What problems have they solved? What predictions did you make in your book that have now come true? What’s up next for your book’s topic? In addition to blogs and articles, why not consider a celebration? Have a party, make a big deal on social media with memes and messages about the occasion, or even a special birthday promotion on Amazon or on your website. Your book, if you wrote it wisely, will remain evergreen for many years, so use this anniversary to create some excitement about your book! Happy Birthday! Cathy Fyock is The Business Book Strategist, and works with thought leaders and professionals who want to write a book as a professional development strategy. She is the author of eight books, including On Your Mark: From First Word to First Draft in Six Weeksand Blog2Book: Repurposing Content to Discover the Book You’ve already Written. To date she has helped more than 150 professionals become published authors. Never thought too much about after the launch aside from standard marketing thoughts. Great ideas Ms. Cathy. Thank you; and God's blessings ma'am. There is no reason you can't or shouldn't continue to promote your book beyond the launch! So glad this was helpful! Book marketing can (and should) be fun! Wonderful ideas! My children's book was published in 2018. I'll be thinking of ways to celebrate.